Working with an A3 system is like constructing a story. This is how a safe space to examine conflict and its sources – and identify the roots of the problem – is created. Problem-solving is a universal and essential skill for every learning organization. Because problem-solving in organizational culture is so important, Toyota developed the A3 system, which enables us to represent a problem clearly as a story within a set structure. Each and every one of the employees (and suppliers) at Toyota has access to an A3 Report (A3 is the largest size page than can be copied on a standard photocopying machine). In a Lean organization, a problem (the gap between what is and what should be) is the central axis along which organizational activity takes place. Of course, it is easier to invent a tool than to use it wisely, and not every problem requires the use of the A3 Report, but the process of thinking on an A3 page provides an opportunity to (graphically) tell a story that is accessible and readily-available to every stake holder coping with the problem. It doesn’t require an expert to understand that people find it difficult to think in terms of numbers and measures. People need to hear stories that shape their consciousness and that they can share with others. Experienced problem-solvers combine – first for themselves and then for others – scientific thinking based on data with a story-like framework that enables them to combine consciousness (emotions, beliefs, passions, and fears) with understanding (rational intelligence) into the decision-making process. In a good story, tension stems from conflict, and a character is experiencing something – dealing with challenges, succeeding, or failing. A story enables us to connect the dots, to understand cause and result, and to create a connection between overt events and underlying root causes. It enables us to understand the relationships and conflicts among the stakeholders and what is involved. The conflict that is the source of the problem serves as a catalyst, moving the plot forward and giving us the opportunity to watch the characters’ behavior and the ways in which they deal with the dilemmas they face. In the end, presenting the problem within the framework of a story enables us to include the crucial tension between human creativity and scientific thinking. To a great extent, Paul Levy’s and his team’s impressive success at quickly improving the levels of service and safety for patients and staff and transforming the organizational culture into a transparent and open system was achieved through internal discussions and public discussions over A3 spreadsheets in a daily post on the blog, “Not Running a Hospital,” in which he breaks down the ongoing work into daily stories. A3 system organize the cycles of thinking and improvement (PDCA), and the pages are written by at least two people, which is important in and of itself. Similar to Hevruta, the Jewish style of learning, or the learning that takes place between a master and his pupil, the design of an A3 necessarily generates work in two’s, but with slightly different roles – the owner of the work, and the mentor. The use of the A3 system replaces the plan (which is determined from above) with interactive planning, since the plan that comes down from the top of the pyramid to the operational units is translated into definitions of a series of problems. Some of these are answered by the development staff, while others are returned as feed back to the planners with alternative options, requests for help, or re-examination of the development demands. According to Kimio Inagaki, at Toyota, the program for the development of a new car model involves approximately 50 A3 Report forms connected (algorithmically) to each other like the roots of a tree and serves as the mapping of the major problems (gaps in knowledge) that will have to be dealt with. No page can be seen in isolation, since each is connected to the trunk of the strategic purpose that the organization and its staff seek to achieve. The map of these problems cuts across the professional units and is held by the administration of the product development program. Managers at all levels of Toyota encourage their workers and team members to engage in a focused discussion of the A3 Reports. 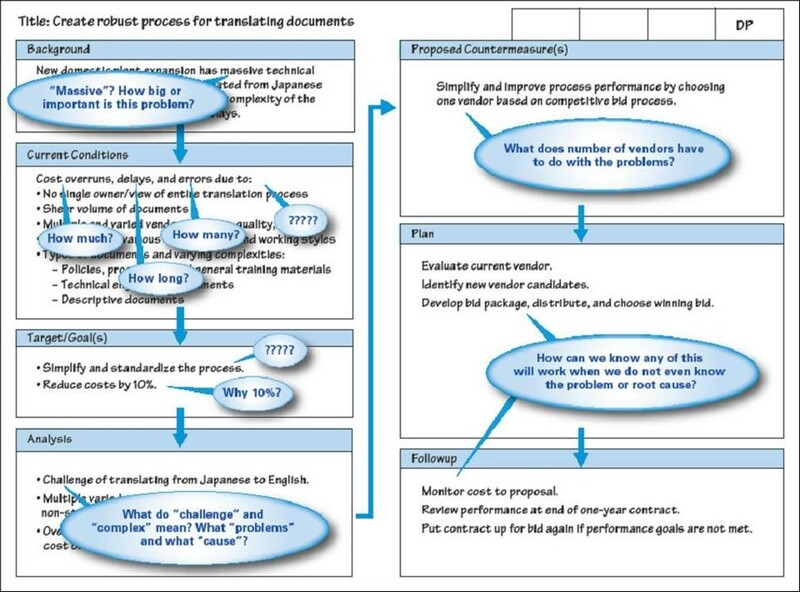 At Toyota, the translation of problems into the language of stories is accepted throughout the organizational hierarchy. In a Lean organization, the managerial discussions center on two types of problems: Caused and Created. A problem is caused as a result of a disruption in the proper process, which exposes the gap between normal and abnormal situations. A created problem is the result of a leader who decides to “raise the bar” for performance by an individual or an organization too high. A Kaizen process of constant improvement is based on the creation of a series of improvement steps – created problems that are intended to focus the organizational units on improving their performance (striving for excellence). It’s Possible to Build a Robot with an A3Report, but that Robot Can’t Work on an A3 Report. Decision-making based on artificial intelligence is limited to one-dimensional, technical problems. Spreading the problem on an A3 Report sheet is a human endeavor – it is personal and social. It creates a safe space in which to examine and explain human behavior, in order to find the roots of the problem. 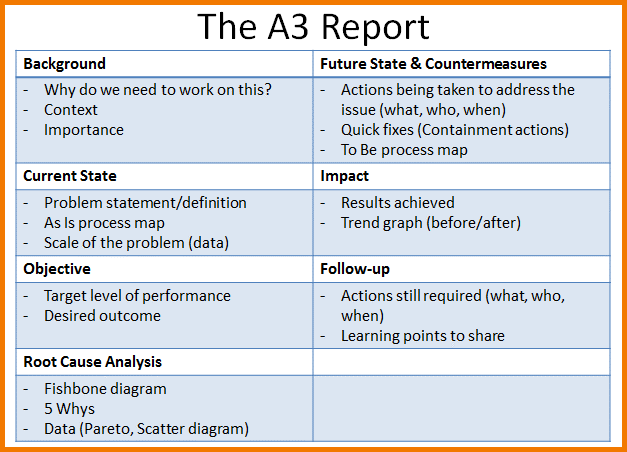 There is no better way to understand the contribution of an A3 Report to decision making than to experience it. You can’t learn to ride a bike based on theory alone – and, in the same way, we recommend setting out on this journey without any fear of making a mistake – and without cynicism or detours.